The day started out fantastic! The girls and I got up at 4 A.M. and watched the Royal Wedding. We had donuts, strawberries, and juice. The Lt. came home from work about 130P.M. and we did cake & ice cream and presents. How blessed am I? The girls and the Lt. spoiled me so. Mikayla made me a card that was short and sweet and to the point. It read “Happy Birthday! Love you. You are 33.” Too cute! She gave me a bookmark with a digital timer on it. Montana picked out a cookbook for me. She is already pointing out which meals she wants made. Hmm…there may have been a secret agenda with the book, but it’s fine I love to cook for family. McKenzie (with the help of Daddy) picked out a sweet camera strap from SewTamz Designs. It is so comfortable and soft and I love the pattern too. Marie choose a snazzy watch necklace from her favorite store, Forever 21 for me. It is so cute and just the right size. Madison picked out a gift card to Barnes and Noble. Have I ever told you how much I love gift cards to the bookstore? I already have books in my cart so they will be on their way for next week. The Lt. surprised me big time with a trip to the upcoming HEAV Homeschool Conference, WaaHoo!!! I am very excited to go, especially since it looked like I wasn’t going to be able to make it again! This will be my first conference, so I have a lot of planning to do so that I stay within my budget. Have any conference tips? Any do’s and don’ts? I would love to hear! 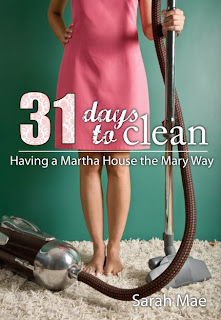 the Mary challenge -something you do that encourages/engages your hear. 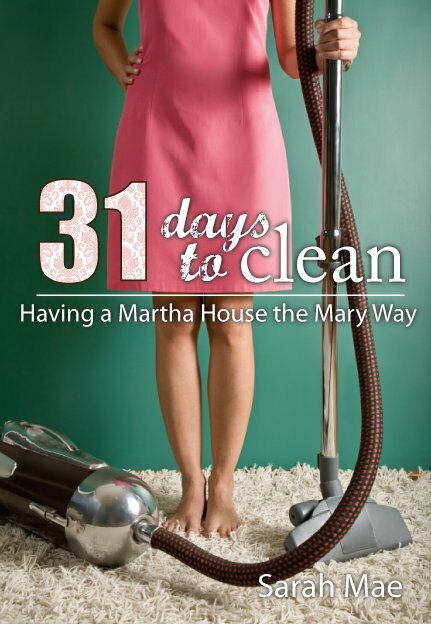 the Martha challenge – specific cleaning tasks. Today only Sarah Mae is giving away free copies of the book! Just check out the facebook page or tweet or blog about it and spread the word to receive a free download. Remember back in mid-March when I posted that Madison & Mikayla made the level 4 gymnastics State Meet? Well, it’s finally coming up…well almost, only 5 more practices!!! They have been hard at work perfecting their routines and getting things down pact. The roster was released today and wouldn’t you know it the girls are on different days and sessions. I knew they would be different sessions because of age, but I was secretly hoping we would be grouped on the same day at least. Well, it’s not the case so I better start preparing myself for the 3 1/2 hour drive. I am on my own that weekend too because the Lt. will be out of town. The girls are looking forward to staying in a hotel for 2 days and all that the trip entails. I am praying that McKenzie’s molars will make their appearance soon, very soon, so at least she will be comfortable. I would hate to miss either Madison or Mikayla compete because of a screaming fit. This is both of their first year as level 4’s and as it stands Madison is competing in the 10-SR1 group with 25 other girls, and Mikayla is in 8-JR2 group with 23 other girls. Wowzers! It will be tough competition for both but especially for Madison because most of the gyms around here hold back their girls so they can be spot on when they compete. We will be happy and excited no matter what, what an accomplishment to make it to State. Have you heard? It’s that time of the year again when us homeschoolers go through our stash and find items we do not need anymore. Jolanthe over at Homeschool Creations is hosting so click on over and find something you might have on your wish list. Today I found out I have an extra set of the Science 1: Animals, Astronomy, and Physics (a.k.a Science B) student activity sheets (brand new) that I purchased back in the Summer of 2009. This set does not include the schedule or teaching helps, it is simply the extra activity sheets. Giveaway will close on Sunday, May 1st at 10:00 a.m (EST). Winner will be chosen randomly and notified by Sunday evening. At that time the winner has 3 days to respond with your address and then your package will be on it’s way. If the winner does not respond in the allotted time an alternate winner will be chosen. Open to U.S. & Canadian residents only. I hope this will be a blessing for someone! Our day started out just wonderful. We enjoyed a great church service listening to Pastor Jim’s word. Came home and had a wonderful dinner and egg hunt in which Madison found the prized Golden egg. Of course we couldn’t complain about the gorgeous 90 degree weather either! I hope you all had a blessed Easter!!! Stumbled the Prince of Peace. To pay the ransom we could not. And not rush to his aid? And life to His purpose. Let me let Him in! For Him for Whom the inn was full. First sculpted me in clay. I prepped the the eggs while the girls and the Lt. were out shopping for my big day on Friday. They had a blast at the mall and even ate out in a cool 50’s diner and had burgers, fries, & malts. This year we used these collapsible dying cups and a new recipe for the dye to get brighter eggs. What’s the secret you ask? Well we had great results by using warm eggs and only 1/2 cup of warm water and 1 Tbsp of white vinegar with the orange, yellow, green, and blue tablets. McKenzie even wanted in on the action. It was short lived though because she didn’t want her eggs, she wanted everyone else’s eggs. Right now, I am going to show you the meltdown McKenzie had in pictures. It’s been a bumpy ride with her the last few weeks, but I am thankful for every teaching moment as she learns how things go. Whew!!! We made it through that one. Sometimes it is not easy being 18+ months. The eggs turned out beautifully bright and everyone had a great time in the end. Clean up was also very easy too so that was a plus for me. Do you dye eggs at your house? How did it go?